Josyf Slipyj and Lubomyr Husar, both cardinals of the Catholic Church and (former) patriarchs of the Ukrainian Greek Catholic Church (UGCC), stand with their predecessor, Metropolitan Andrei Sheptytsky, as towering figures in not just Ukrainian Catholicism, but world Christianity. During a time of unparalleled persecution in Eastern Europe, all three worked to build-up, preserve, and, then, rebuild the UGCC in both its traditional homeland and the diaspora. And yet with respect to Slipyj and Husar in particular, it seems that both had very different ideas about what it mean to be a Greek Catholic or, to phrase it another way, “truly Catholic” and “truly Orthodox” during a period in history where both concepts began to lose their traditional ethnic-national character. In studying Jaroslav Pelikan’s highly sympathetic portrayal of Slipyj alongside Atoine Arjakovsky’s extended interview with Husar, it becomes clear that some of the oldest tensions in Greek Catholicism were embodied in both men, particularly with respect to the Ukrainian Church’s relationship with Rome; the degree of ecumenical freedom it should have in its relations with the Orthodox; and whether or not it is possible (or desirable) to draw a clean line of demarcation between “Western theology” and “Eastern theology.” With respect to the last point, Pelikan makes clear that Slipyj embodied some of the best of both Latin and Greek learning whereas Husar, by his own admission, remains suspicious of Scholasticism and Western theological concepts. I make mention of this because in reading (or, in the case of Pelikan’s work, rereading) these two books which, admittedly, have very different aims, it’s Slipyj and Husar’s divergent approaches to what is generally known as “Latin theology” that really struck me. According to Husar, Slipyj came into his own during a time when Ukrainian seminarians were expected to follow time-honored Latin models, but eventually emerged from the Gulag as a prelate with more authentic Eastern sensibilities. While it is now impossible to know what Slipyj himself would have said about this observation, it is noteworthy that Pelikan goes to great lengths to stress the convergence between East and West in Slipj’s thought as evidenced by the latter’s deep appreciation of St. Thomas Aquinas. This is not to say that Slipyj in any sense rejected Eastern theology, only that he apparently did not live under the belief that the East/West divide was so significant that it required one — depending on ecclesial affiliation — to rally fully to one side or the other. As Pelikan stresses, Slipj’s love of the Eastern Fathers was always apparent during his life, as was his desire to put at ease theological objections emanating from the (Orthodox) East concerning matters such as the filioque. Husar, by his own words, seems less bothered by theological distinctions and more concerned with broadcasting to the universal Church that when it comes to Greek Catholics and Orthodox, there is a shared faith but not a shared communion. Practically, our attitude is that between the Orthodox and us there are no differences in faith. Questions like purgatory, the Immaculate Conception or the filioque are theological concepts, not faith. And they of course are very different, but they are ultimately complementary. So they do not represent a different faith. They represent a different understanding of the gift of faith (pg. 52). Beyond these differences, what is clear from both books is indebted both are to the legacy of Metropolitan Andrei. Both saw in Sheptytsky a greater leader who desired above else to nurture a living, breathing Ukrainian Church with its full rights and heritage respected by the (much) larger Roman Church. At the same time, Skeptytsky looked ahead to the day when the Catholic/Orthodox division could be dissolved and an autocephalous Ukrainian Church — in full communion with Rome — would appear. Despite making inroads with the Orthodox that were well ahead of their time, Sheptytsky’s vision was brutally interrupted by two world wars and the political turmoil which surrounded them. When Sheptytsky went to his heavenly reward, it fell to Slipyj to carry on the metropolitan’s mission — a mission brought to a halt by the Soviet authorities in concert with the Russian Orthodox Church. Husar, along with his family, managed to escape the Soviet state’s reprisals against Greek Catholics, living first in Austria before immigrating to the United States. His time in the West exposed him to developments in Orthodox theology which no doubt informed his conviction that for the UGCC to fulfill its divine promise, it must return to its Eastern roots in toto. At the same time, having witnessed a new attitude toward the Christian East inaugurated in part by the Second Vatican Council, Husar appears to have had higher hopes for Catholic/Orthodox relations than either Sheptytsky or Slipyj. While it is not entirely fair to compare Confessor and Conversations given their respective differences in purpose and intention, those interested in the history of the UGCC in the 20th Century and the actual fruits of Sheptytsky’s legacy should pay both careful mind. 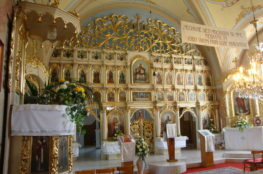 When read together, they raise some interesting — and difficult — questions about the role of the UGCC in the wider Catholic Church while forcing readers to think through the extent to which theological and doctrinal differences — apparent or real — ought to lie in the way of full ecclesiastical union between Catholics and Orthodox. Should it be the task of UGCC theologians and bishops to get on board with Slipyj’s aforementioned “realism” by critically evaluating Orthodox claims against the papacy and Catholic doctrine and responding in kind? Or does Husar’s “idealism,” with its conviction in a shared faith between Catholics and Orthodox, prove a better, more feasible, model of not just ecumenical relations, but concrete ecclesiastical unity? Or perhaps there is a way yet to integrate both approaches into a common plan for the flourishing of authentic Christianity in the East without any disruption or abridgment of unity with the West. Thank you for this post. 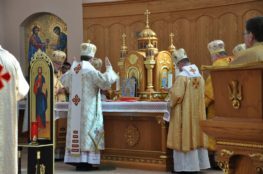 The UGCC is a coal mine canary for Ritual, hierarchical and theological diversity within the Catholic Church. I believe that ultimately the two positions which you present will be the guide rails of legitimate Christian diversity within the Church and the answer will be somewhere between these two towers of Eastern Catholicism.